A friend sent the best kind of text. She asked when I could be available to come for dinner; she had a vegan recipe she wanted to make for girls’ night. Count me in! She set the table with a charming quilt she’d made and heirloom china, beautiful plates with a raised spot for a tea cup in which she served soup. She had veganized a recipe she’d tried a few times to good results, and we went back for more and more and more–dainty cups couldn’t contain enough hearty veggie goodness. The kale for the soup came from her garden; so did the lettuce in the salad, to which she added strawberries, walnuts, and avocado. Another friend came straight from her shift at a local winery toting a couple of bold reds. With inviting hospitality, good friends, delicious food and drink, this weeknight could not have been any better. Before grocery shopping this weekend, I noticed that the weather report indicated another cold front approaching. Indeed, today on this first day of spring the skies have again turned gray and wet, which makes it a perfect soup night. I bought butternut squash, already cubed because I couldn’t find whole, but forgot the kale. 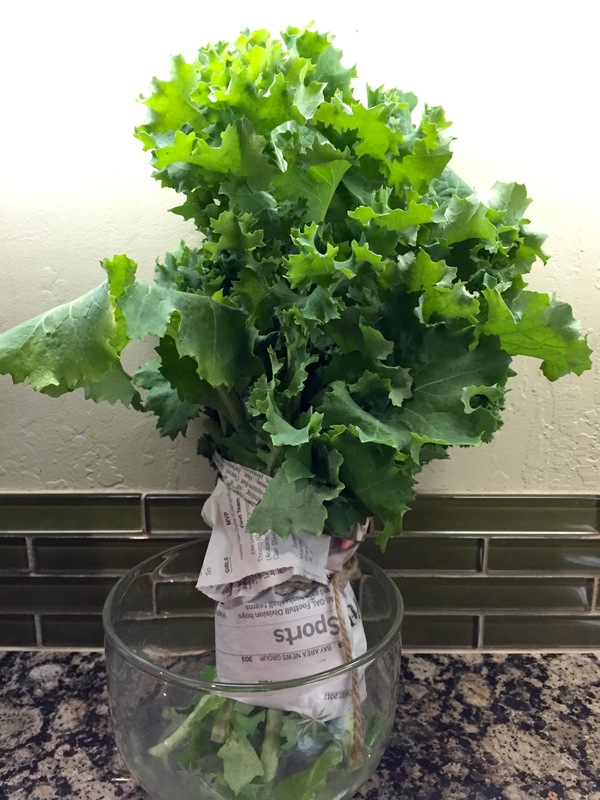 Imagine my delight when I came home to find a bundle of fresh kale on my doorstep, yet one more gift from my friend. 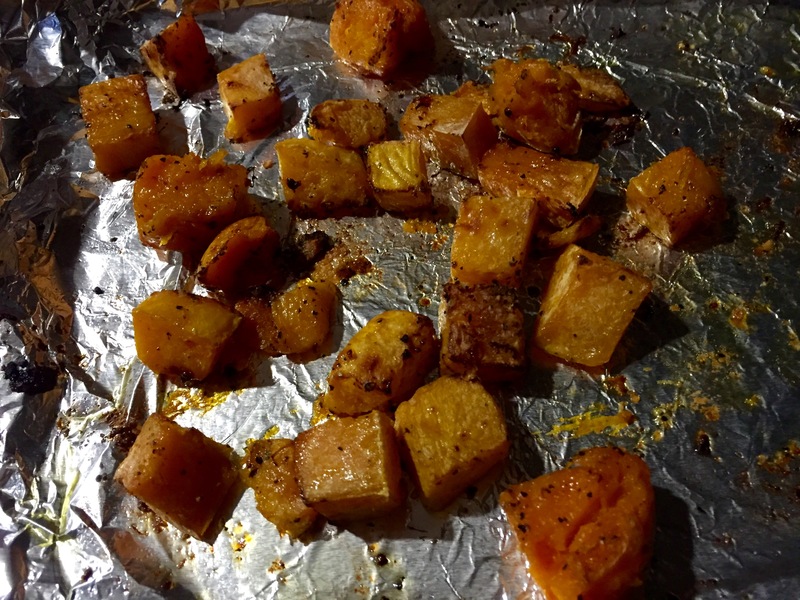 On a roasting pan, drizzle cubed squash with oil and sprinkle with pepper and 21 Seasoning Salute (or other no-salt herb mix). Roast for 25-30 minutes at 400 degrees. (Note: you could skip this step, but roasting brings out so much fabulous flavor that I think it’s worth it. If you add squash straight to the pot, you might need to add another 5 minutes or so to the total cooking time). In a large stock pot, saute onion for 2-3 minutes until softened. Add garlic and saute 1 minute. Add farro and toss to coat. Add broth, roasted squash, tomatoes, and spices. 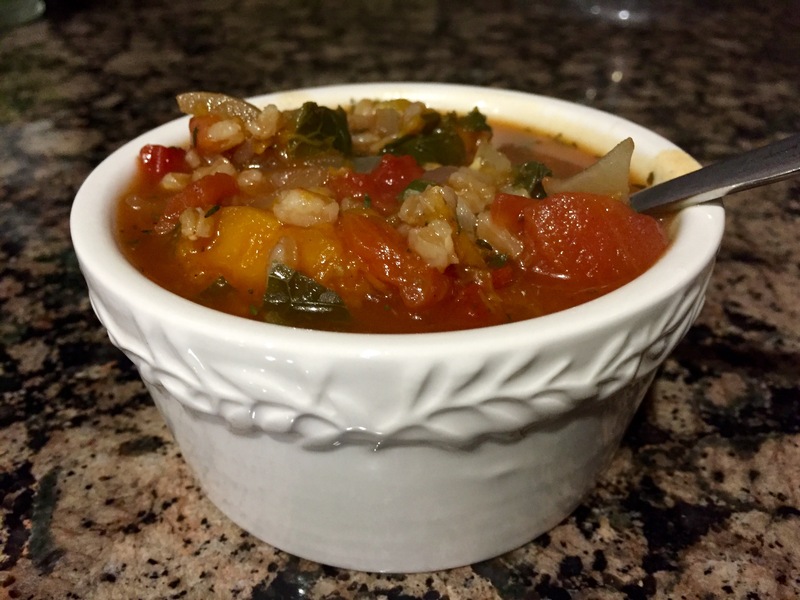 Bring to a boil, then reduce heat and partially cover, simmering until farro is cooked, about 25 minutes. Stir in kale and simmer until wilted, about 2 minutes (if you’re not serving right away, you can add kale and remove pot from heat; leave covered until ready to serve). Adjust seasonings to taste.